The Directorate of Education (S), Government of Manipur has released the examination centre for the written examination for the recruitment of Contract Lecturer Government Higher Secondary School. The written examination for the recruitment is scheduled on 11th Nov 2018, from 11 AM to 12:30 PM. And the admit card for the same has been released earlier. The written examination will be held on 11 different centres in Imphal. And the roll nos of the candidates along with the exam centre are as as follows: (As released by the Directorate of Education (S), Manipur. It has also been informed to all the candidates to bring their admit card and to reach the examination centre 30 min ahead of the commence ment of the examination. The upper age limit for the candidates shall be 38 years as on1,/7/2018. Age relaxation applicable as per govt rule. 1. For Lecturers: Post Graduate Degree with at least 50% marks in the subject concerned in the Post Graduate Degree examination from a recognized University. 2. For Tribal Dialect Lecturers: At least 50% mark in Post Graduation in any of the Launguage subject namely Manipuri or English or Hindi and profciency in the concerned Dialect. The appointnent shall be purely on Contract basis for the period from the date of contract agreement upto 28/2/2019 as per regulation prescribed by the Government. 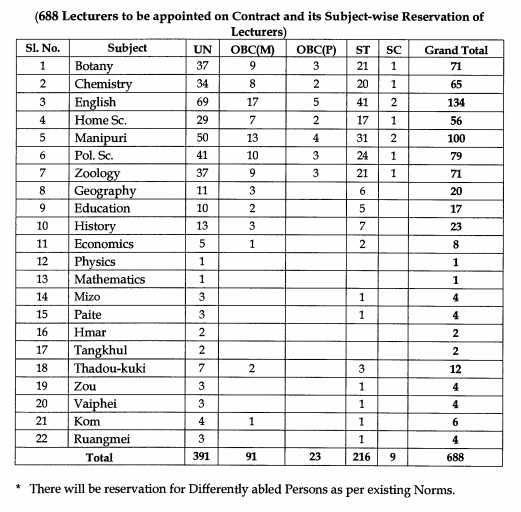 The mode of selection for engagement of eligible candidates as lecturers on contract shall be on the basis of written test and personal interview/viva voce with weightage of 80% and 20% respectively. Shortlisted candidates for Personal interview shall be in the ratio of 1:5 of the vacancy. The subject wise syllabi for written test is also uploaded in the website.